Master the tools of the animation trade with this tools subscription. If you're a fan of Pixar films, you know how powerful animation can be. Just as animation can move us to tears and make us laugh, it can also be used as an effective and successful marketing tool. With Animatron Studio Pro Plan: Lifetime Subscription, you're getting a set of tools that will allow you to create exciting graphics and pretty animations, even if you have no graphic design experience whatsoever. 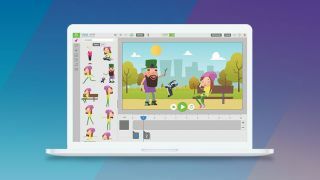 You'll be able to choose from a varied collection of thousands of totally free, pre-animated characters and backgrounds, and you can also edit your own images, audio, and even video content. You'll be amazed at all the amazing artwork you can create directly on your browser. Get Animatron Studio Pro Plan: Lifetime Subscription for only $49.99.